Protect your bar chairs from nicks and scratches with Bar Chair Protectors. The rail on the bar stool provides a comfortable rest for feet and a ladder step for high height stools, but those climbing, hanging, and banging feet can damage your chair rails. KSC is offering a variety of bar stool chair protectors to keep your chairs from being damaged. Chair protectors are available with either polycarbonate construction, stainless steel construction, or anodized aluminum construction. Polycarbonate chair protectors come in either clear, beige, black, bright white, brown, grey, ivory, linen white, sand, sawdust, or taupe. Stainless steel chair protectors have a classic stainless steel finish. Anodized aluminum comes in satin gold, #4 brushed gold, or bright polished gold finishes. There are two easy to install styles of chair protectors available for stainless steel and polycarbonate chair protectors: peel-and-stick protectors or protectors with countersunk holes and screws. Anodized aluminum comes in peel-and-stick protectors or standard (no adhesive backing / no countersunk holes). 2-sided guard designed to protect the front and top of each foot rail. Sizes: 1"x1"x12", 1"x1"x12", 1-1/8"x1-1/8"x12", 1-1/2"x1-1/2"x 12", 2"x 2"x 12", 1"x 1"x16", 1-1/8"x1-1/8"x16", 2"x 2"x16"
8 size options available: 1"x1"x12", 1"x1"x12", 1-1/8"x1-1/8"x12", 1-1/2"x1-1/2"x 12", 2"x 2"x 12", 1"x 1"x16", 1-1/8"x1-1/8"x16", 2"x 2"x16"
Do the peel & stick work on round stretchers? Can the rail protectors, be cut. Our chairs and stools fall in-between the sizes. Thank you. Will the peel and stick leave any residue or damage the finish when you want to remove them ? I have counter height stools that are dark wood. The top width of the front footrest rail is 1/2 inch; the height of each rail is about 1 inch; the footrest is 14 inches wide. Since we sit on these every day and put our feet on the rails, I am looking for something to protect them similar to what came on my bar stools. Do you have anything that would fit/work? I don't want to drill holes in the wood. Protect your bar chairs from nicks and scratches with Bar Chair Protectors. The rail on the bar stool provides a comfortable rest for feet and a ladder step for high height stools, but those climbing, hanging, and banging feet can damage your chair rails. Thank your for your review. We very much appreciate you taking the time to provide your feedback. Your past, present, and future business is greatly appreciated. Thank you for your review. We are pleased our Stool Rail Protectors ue're easy to install and met your expectations. Great product to save furniture! I was very impressed with my purchase. The shipping was fast and the coupon code was a much needed addition. 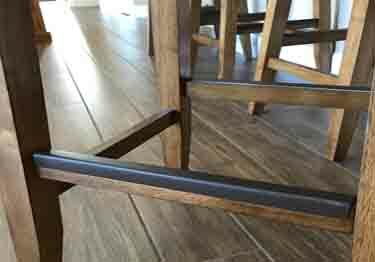 The bar stool foot rail protector are easy to install, thick and of good quality, and hard to notice. These protectors were the best invention.... I am actually looking to order more! Thank you for your review. We very much appreciate the kind words concerning the quality of our Stool Protectors as well as our quick shipping.